Derry's new 'Director of Football', Brian McIver. Brian McIver has been appointed Derry’s county’s new ‘Director of Football’ less than three months after stepping down from the senior manager’s position. A disillusioned McIver walked away from his previous post following July’s controversial qualifying defeat in Galway after which he strongly criticised the performance of Cork referee Conor Lane. The Oak Leafers are yet to appoint a replacement but this morning announced details of an ambitious restructuring which they hope will provide the new manager with the players to succeed at the highest level. 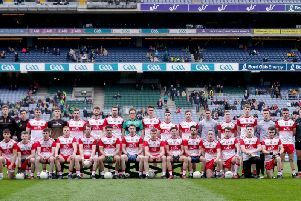 Having launched the Derry Hurling Academy (DHA) back in January 2015, this latest move is in line with Derry’s strategic plan 2012-2017 to integrate a High Performance department into existing coaching structures managed by Games Development Manager, Chris Collins, and which currently incorporate Performance Analysis and Strength and Conditioning as key areas. The role of Director of Football will be to oversee the development of players and coaches and to help develop a consistent approach to preparations and performance across all age levels. Commenting on his new role, McIver said he was sure he could build on the good work already being done in the county. “I want to thank Derry GAA for giving me this opportunity,” explained McIver, “This is very much a player-focused effort. It is about the development of players for the long-term and about giving players the opportunity to be the best that they can be for their clubs and their county. This can be done by providing the best possible facilities, coaches and structures to the players and their parents.